A villain is the evil, immoral guy of a story. The etymology of the word villain comes from the Latin “villanus” meaning “farmhand“. He is antagonist to the knight not only for his low social status but for those moral values of chivalry: faith, loyalty, courage and honour that do not seem to affect his world.The villain is often cruel, malicious and devoted to wickedness. The typical villain of the Morality plays was the devil himself:Satan. In the Elizabethan Drama the villain’s want of morality allowed him to act against the laws of nature and God which were at the basis of society and thus breaking them he gave the start to the dramatic action. The audience could easily spot villains on stage because dramatists often used to choose for them names that hid the clues for their moral imperfection. In Hamlet, for example, Shakespeare called the villain Claudius, which comes from the Latin “Claudus” that is “lame”. Sometimes the names could also point out the dangerousness of the villain. Richardson seemed to warn his unfortunate heroine Clarissa naming the man of her dreams Lovelace, truly a loveless man whose lace of love will strangle her to death. 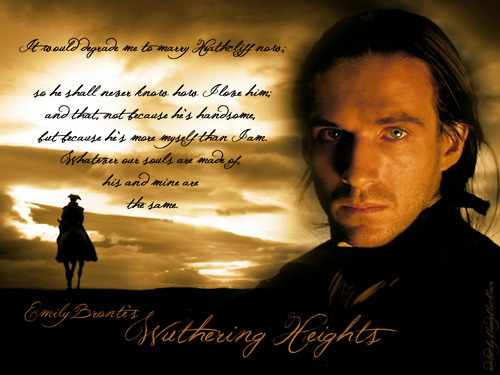 Heathcliff as well belongs to the cathegory of the villains. Emily Brontë chose for his protagonist a name that could mirror all the enigmatic nuances of his personality. He is heat, heath and cliff at the same time, that is wild, passionate, maybe stubborn, but definitely dangerous and uncontrollable. He is a modern Satan, dark( “he looks like a gipsy“), retiring, elusive and vengeful. Wherever he goes he upsets the preexisting balance bringing chaos and sorrow. Once adopted, for example, he will win Mr Earnshaws’s affection causing such frustration and jealousy in his son Hindley that will fire up their deadly fight. The same destiny will share the Lintons’ when, after a mysterious absence of years, Heathcliff will turn up at their door only to carry out his revenge. Nothing and nobody will stop him. Not even love.